Born in Russia in 1946, he graduated from the faculty of Fine Arts Odessa pedagogical university in Ukraine in 1970. 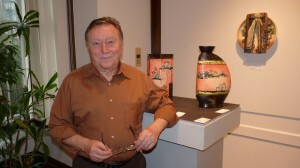 Alexander Kastulin started working with clay in 1978. Since then, his works have been demonstrated at numerous international exhibitions and were awarded many times. Currently his works can be found in collections at the Odessa art museum, Ukraine and in private collections in Hungary, Bulgaria, Finland, Israel, U.S.A., and Japan. Since 1998 Alexander has been living and working in Toronto, Canada. Alexander Kastulin creative search is aimed at perceiving the innermost possibilities of the language of ceramics. His artistic activity ranges from closeness to rational design to purely intuitive works, based on the subconsciousness. He’s attracted by various genres, including monumental and decorative panels and easel paintings. The manner of rending, the mood of his works shifts from lyricism to the seriousness reaching dramatic effect. Alexander Kastulin rejects the borders between different kinds of art, between painting, sculpture and drawing but he never forgets the specific character of ceramic art. While a sculpture’s work is born as if from within the mass of a heavy stone, the method of a ceramist is based on the understanding of the expressive possibilities of the surface. And it is the surface that the attention of the ceramist is concentrated on, this is where the “genetic” memory about it’s origin either from the clay rolled “layer”, or from the plate or the vessel (jug) is captured. Alexander Kastulin works originate from the desire to express his feelings apropos of constantly changing people’s relations. They are born as if despite the will of the author, reflecting the creative demand to express his hidden deep emotions concerning people’s iterations. This work born from an artist’s subconsciousness more influences heart than thoughts of a spectator. The parts of the works are associated with sharp cutting and stabbing. Alexander Kastulin art tells us about the bright work of the artist’s associative thinking which helps him to find the exact shape of his feelings, thanks to mastering the complicated ceramics technique. “Abstract things express what we merely do not see”, says the artist. “Such compositions born from subconsciousness demand great confidence, intuition and cutting of the conscious level. This method is difficult because you constantly have to control yourself in order not to let common sense into the process. When you work you don’t think about what you do. The hand itself knows what to cut from the clay mass. You only need to get the conscious level at the end of the work” admits the artist. “A work is born like a child. All the time you have to feel the tectonics of your creation. It can fall, sink, it can be wounded”. Alexander Kastulin works have some peculiar energetic fields. Through the complicated process the artist expresses his sensation of life with its troubles, beauty and uniqueness. This is the main reason why mass production ceramics will never replace the artist’s original art. Master Degree of Fine Arts. Odessa Pedagogical University 1965-1970, Odessa, Ukraine. College of Arts 1959-1963, Odessa, Ukraine. Distinction short list. International Miniature Art BiennialSalle Augustin-Chenier. Ville-Marie. Quebec.